MangaHelpers > News > Shout-Outs > Manga Shouts! Ushio and Tora! Manga Shouts! Ushio and Tora! Starting this week, we'll be announcing a new manga shout each week. Don't know what a "Manga Shout" is? Check this thread and find out more. Now, on to the "Shouting"!! Scanlation Status: Volume 1 released by G.O.D. 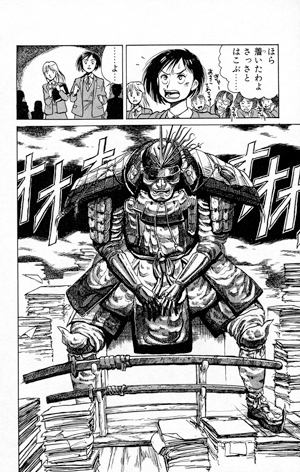 Manga, very lq, could be a lot better. 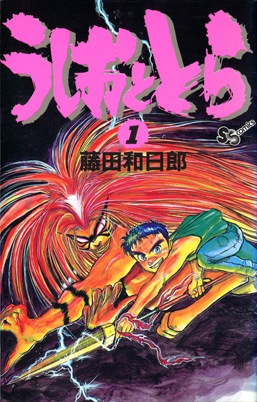 Ushio and Tora is about a guy, Ushio Aotsuki, and a tiger named Tora who hides his appearance at will. Straight out the books like a shounen action version of Calvin and Hobbes Ushio goes around with Tora and together they take out many old creatures from Japanese legends that want to give the two trouble. But don't let their current "friendship" fool you, their original meeting wasn't exactly friendly with Tora wanting to do nothing but eat him, and raise hell with all the humans that are alive at the present time. But who could blame Tora? He was pinned down in a dark hole for the past 500 years by a samurai. Coincidentally, it just so happens to be Ushio's relative that pinned him down using a cursed spear called the "Beast Spear" and thus their love-hate relationship begins. The art is of the Shounen look so not the best but definitely not the worst. Sometimes it's comical, sometimes it's a bit messy and sometimes it's actually quite clean. But overall it's nicely done and shouldn't distract you from enjoying the series. With the whole Nurarihyon no Mago (Nurarihyon's grandchild) manga just coming out, Gantz fighting a Nurarihyon in the current chapter and then this manga it seems like the perfect time to learn a whole bunch about Japanese mythical creatures. 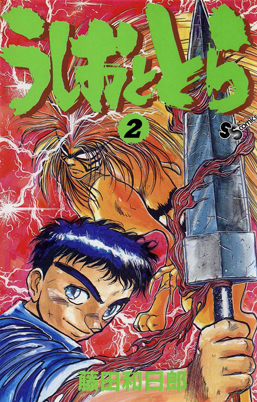 This manga was originally released in 1990 and ran for 6 years winning a award its second year released makes it a manga that I'm sure will appeal to a lot of people. However it's 33 volumes, and so a daunting task for any translator and scanlating group. But personally it looks like a neat series and I'm sure it could get quite popular. dang :P this looks like it could be fun. Hell yeah! watched the OVA as a kid I hope this gets scanlated! Looks like a good series..I hope there will be some guys that will do the job. Well I'll be! They need to update mangaupdates then :p. Thanks for letting us know :). Hmmm I checked out the scan (was a challenge to find) And not only is the quality very LQ but the translation (while not horrible) could be done a lot better. (the major problem was, while they got the meaning across they often didn't translate the entire dialogue of what is being said.) That said, I'm not sure if I should say there is a scanlation out, or to let it be and hope someone redoes it with much higher quality. i've read this manga a long time ago(too bad i havent finished it yet as the magazine which serialized it in my country discontinued the series), its a very very good manga. I really hope someone will scanlate it here.. btw,this manga also have some comedy in it. This manga looks pretty awesome, I'd love to read it! Too bad I don't know Japanese. thats why we hope some group will pick up this series. this is prolly one of the best youkai mangas, pretty complex story with many interconnected subplots leading to one final awesome arc. btw, the spear is cursed, not blessed. This manga is a classic!!! I read it in Italian and it's surely one of the best and underrated manga in history. There's a lot of stuff from the end of '80s till the mid of '90s that is really unknown to the world. Haha, oh man I can't believe people are still linking to GOD Manga. Not to sound like I'm shifting the blame, but the Mandarin version used was very poor in terms of translation (Typical of older series translated in the 90's; I guess they figured it's mostly for children so they didn't bother putting in the effort). But then again, I don't know squat about Japanese so using the original was out of the question. Ushio's name was changed to "Chen Ma" and the title was changed to "Magical Power Shiao Ma". I guess they thought Tide & Tiger would be unappealing to younger readers. Ironic thing is, I didn't pick up this series until way later.